Cake Wars: Christmas is back. Recently, Food Network announced a new season of the holiday series will debut in November. Hosted by Jonathan Bennett, the cooking competition show pits seven teams of dessert experts against each other in a series of holiday cake-themed challenges. Cake Wars: Christmas returns to Food Network with new episodes on November 14th at 9 p.m. ET/PT. New York – October 24, 2016 – The Cake Wars kitchen is getting a holiday makeover on the season premiere of Cake Wars: Christmas, beginning on Monday, November 14th at 9:00pm ET/PT on Food Network. Jonathan Bennett hosts the six hour-long episodes filled with the most over-the-top Christmas cake confections ever seen. On this holly jolly competition seven teams consisting of a cake artist, sugar sculptor and master food carver are put to the test in two rounds of challenges where they must showcase their skills, creativity, and imaginations. First, in the Stocking Stuffer Challenge, it is a race against the clock to create edible holiday-themed cake displays. One team will earn an advantage in Santa’s Mega Challenge, where they must outdo each other with mind-blowing, masterful cake creations. Holiday crafter extraordinaire Charles Phoenix and renowned pastry chef Sherry Yard together with weekly guest judges will eliminate one team each week until one jingles all the way home with the $50,000 grand prize. Fans can visit FoodNetwork.com/CakeWars for photos of the festive, eye-popping creations from the show and watch behind-the-scenes videos featuring Jonathan Bennett and the judges. They can also join the conversation using #CakeWars. 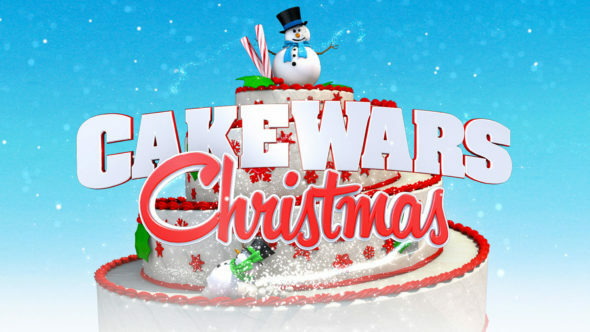 Cake Wars kicks off the first of six Christmas-themed battles, as seven teams composed of a cake artist, sugar sculptor and master food carver take to the kitchen. In the first round, they’ll have to tackle the worst gift under the Christmas tree. Then, in round two, they’ll give Santa Claus the first makeover he’s seen in centuries. At the end of the battle, one team will be eliminated, and the rest will move on to compete for $50,000. Singer-songwriter Megan Nicole joins host Jonathan Bennett and judges Charles Phoenix and Sherry Yard. The six remaining teams made up of a cake artist, sugar sculptor and master food carver return to battle to celebrate the 50th anniversary of How the Grinch Stole Christmas. In the first round, they’ll create a modern twist on the classic holiday tale. Then, in the second round, they’ll have to lend the Grinch’s lair some holiday spirit fit for Dr. Seuss. At the end of the battle, one team will be eliminated with help from guest judge Susan Brandt, President of Dr. Seuss Enterprises who joins host Jonathan Bennett and judges Charles Phoenix and Sherry Yard. Five remaining teams made up of an expert cake artist, sugar sculptor and master food carver return to battle to create mind-blowing Christmas fantasy creations, and in the first round, they’ll be challenged to show how Santa’s elves get in shape. Then, the teams must give the Nutcracker a modern twist. Special guest judge Tamera Mowry-Housley, host of The Real and avid holiday crafter and baker, will help host Jonathan Bennett and judges Charles Phoenix and Sherry Yard determine which team is eliminated. Jonathan Bennett hosts as the four remaining teams composed of a master cake artist, sugar sculptor, and food carver return to battle to design mind-blowing Christmas creations. In the first round, they’ll have to imagine Santa’s disguise when he goes undercover. Then, in the second round, they’ll be challenged to create a delicious world where animals of the forest celebrate Christmas. At the end of this battle, one more team will be eliminated in the quest for the $50,000 grand prize. Judges Charles Phoenix and Sherry Yard will be joined by special guest judge, cake artist Yolanda Gampp,to determine which team will be sent home. We’re down to the final three teams of cake artists, sugar sculptors, and master food carvers who need to help out Santa with a very important gift – the one for Mrs. Claus, herself! Then, in the second round, the teams must create the ultimate Santa’s Workshop. In the end, one team will be eliminated, and the rest will continue to face off for the $50,000 grand prize. Host Jonathan Bennett is joined by Jackie Sorkin of Hollywood Candy Girls, and judges Charles Phoenix and Sherry Yard to determine which team will take the cake in this challenge. Jonathan Bennett hosts this epic final battle! The two remaining teams made up of an expert cake artist, sugar sculptor, and master food carver go to battle one last time, to give us an amazing, edible Rudolph’s Christmas card. Then, in the winner-take all final round, they’ll face the monumental task of creating the ultimate Christmas front yard. When the gingerbread dust settles, one team will jingle all the way home with $50,000. Judges Charles Phoenix and Sherry Yard will be joined by guest judge Olympic Gold Medalist Kristi Yamaguchi to determine the winner. What do you think? Are you a fan of Cake Wars? Will you watch the new episodes? More about: Cake Wars: Christmas, Cake Wars: Christmas: canceled or renewed?, Food Network TV shows: canceled or renewed? Will cake wars and cake wars Christmas return? What happened to cake wars: Christmas? Why didn’t it return in 2017? It is my favorite show after Halloween wars.